It looks like Craig Biggio’s finest achievement wasn’t winning the Hansen Award as Suffolk County’s top running back at Kings Park High. One of Long Island’s favorite sons is now a member of the National Baseball Hall of Fame. –Biggio is one of just 28 players in ML history to reach 3,000 hits, and is also one of just 14 players in Major League history to reach both 1,000 extra-base hits and 3,000 total hits. –In his career, Biggio tallied 3,060 hits, which ranks 21st all-time in Major League history, and 11th all-time among right-handed hitters. –His 668 doubles are the most in Major League history by a right-handed hitter and rank fifth all-time among all hitters. –Biggio holds the NL record for career leadoff home runs with 53 and the modern Major League record for being hit by a pitch (285). –Biggio is the only player in MLB history to reach all four of the following milestones: 600 doubles, 250 homers, 3,000 hits and 400 stolen bases, and is one of just three players all-time to reach 3,000 hits, 200 homers and 400 steals, joining Hall of Famers Paul Molitor and Rickey Henderson. –Five Silver Slugger awards, one as a catcher, four as a second baseman, latter ranks T-3rd for the position. –One of five players to win Silver Slugger award at multiple positions, joining Albert Pujols, Gary Sheffield, Bobby Bonilla and Miguel Cabrera. –Seven All-Star appearances (voted the starter at second base in four straight seasons from 1995-98). –Became first player ever to be named an All-Star at both catcher (1991) and second base. –Four-time Gold Glove winner (ranks T-7th all-time among second basemen). –Had his No. 7 jersey retired by the Astros on Aug. 17, 2008. –2004 inductee into both the Texas Baseball Hall of Fame and the Texas Sports Hall of Fame. –2014 inductee into the Ted Williams Hitters Hall of Fame. –Member of Kings Park High School Athletics Hall of Fame, and the Suffolk County Sports Hall of Fame. 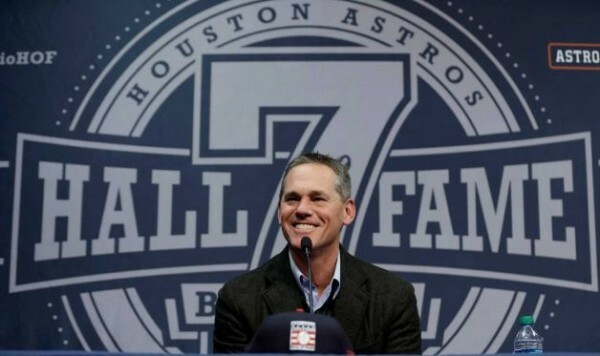 Biggio will be inducted alongside Randy Johnson, Pedro Martinez and John Smoltz in Cooperstown on July 26.